Ian Baird’s Spitfires travel to Bishops Stortford on Saturday at Woodside Park in the Blue Square Bet South. The Blues were formed in 1874 situated in Hertfordshire and sit in 16th place in the league with 31 points,22 points behind Eastleigh. The last game between these two teams was at the Silverlake Stadium where the match finished 1-2 to Bishops Stortford with Reading player Brett Williams scoring the only Eastleigh goal in The Spitfires first game of the season. The Spitfires have won seven out of there fourteen away games in the league this season, three of them being losses whereas Bishops’ Stortford have only won four at home out of sixteen -,ten being losses. 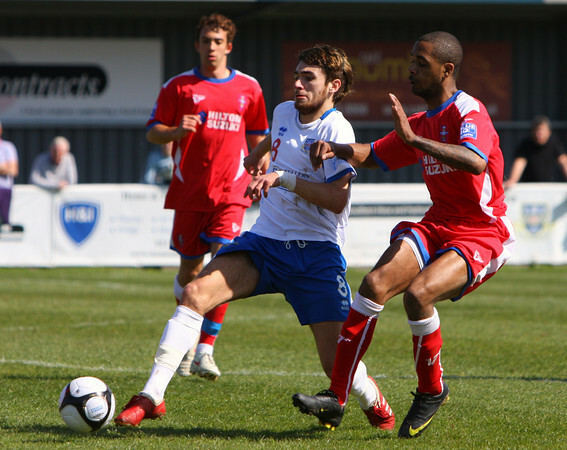 Bishops Stortford have lost five out of their last six games and drawn one Eastleigh have won four and have lost two. This will be Eastleigh’s first away game in one month after five straight home games in the league at The Silverlake Stadium. The Spitfires last two meetings at Woodside Park with Bishops Stortford has seen The Spitfires triumphant to 0-1 and 3-4 wins. Bishops Stortford’s last 20 games have seen them keep six clean sheets (four of them being at home) and they have failed to score six times (four at home). Eastleigh on the other hand has had five clean sheets in their last twenty games (three away) and have failed to score twice but the last time Eastleigh failed to get on the score sheet was six months ago against the league leaders Braintree.